Asheville, NC has evolved into an eclectic, artsy, and fun town that attracts travelers from all around. It's a particularly popular destination during the fall months when the leaves are colorful and the hiking is at its best, but visitors will find plenty to do anytime of the year. There are festivals year around and many of the towns bed and breakfasts are beautifully decorated for the Christmas holidays. If you're looking for a romantic getaway, Asheville is a favorite destination for many couples. There are many bed and breakfasts that visitors can choose from, and each has its on atmosphere and style. Rooms are typically unique and personalized and meals are prepared with local charm. Southern hospitality abounds, and you'll likely find yourself chatting with other guests as you relax in a rocking chair on the front porch. This bed and breakfast is perfect for couples who want to stay near the renowned Biltmore Estate. It's the closest inn to the grounds and offers stunning views of the surrounding mountains. The inn has many features that are rare in bed and breakfasts. These include a fitness center, computer station and a business center. There are seven rooms in total and each has its own fireplace, spa style tub, comfortable bed, and flat screen television. Breakfast is very impressive at this inn. The award winning chef works hard to create menus that are seasonal and unique. He uses local ingredients and adds a personal touch to every dish. The gourmet breakfast is served at 9 am and guests can choose between outdoor seating or private seating. During the warm summer months most guests enjoy their meal on the outdoor porch. The Albemarle Inn is a beautifully restored Greek Revival mansion that offers guests a unique and relaxing stay. This bed and breakfast is situated in a peaceful residential part of Asheville in the Grove Park District. It's near many of the cities popular destinations including the Biltmore Estate, downtown Asheville, and more. 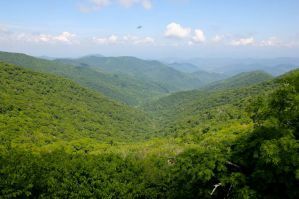 You can easily reach the Blue Ridge Parkway and enjoy some of the area's best hiking. The Albemarle Inn has beautiful gardens where you can relax and soak up some southern sun. There are views of the surrounding mountains and refreshments are made available in the evenings. There are 11 rooms available and each one has it's own unique style and atmosphere. The rooms are elegantly decorated with a comfortable bed, quality linens, and a fascinating decor. A three course breakfast is served to guests every morning and you can dine on the outdoor porch which looks out on the gardens. If the weather is less than ideal you can enjoy the meal in the dining room where there is a cozy fireplace. This AAA Four-Diamond Bed and Breakfast is in a quaint and historic part of Asheville. It's beautifully furnished with antiques that date back to the 1700's and offers a unique and elegant atomsphere. The hosts welcome you with southern hospitality and you will quickly feel right at home. The setting is romantic and peaceful, and it's the perfect place to spend some time away from the chaos of everyday life. The B&B has 8 rooms that each have king sized beds, jacuzzi whirlpools, showers, fireplaces, televisions, refridgerators and more. There's also a pet friendly carriage house in the rear building. Every morning a three course breakfast is served with a fruit dish, an egg dish and a dessert. Coffee and tea is brought to your door at 8 am and breakfast begins at 9 am. There's also a social hour when guests can mingle between 6 pm and 7 pm. On Saturday evenings you can enjoy live music during this time. Blue grass or mountain music is often the style of choice. This B&B is located near the University of North Carolina at Asheville. It's also in easy access to the city's botanical gardens and the Grovewood Gallery. There are some unique features available to guests such as an outdoor pool that is open when the weather is warm. There's also a library available to guests as well as free wireless internet access. The owners have gone out of their way to highlight the building's history and elegance. They are very knowledgeable on the history of the Reynolds family and can provide you with a thorough and entertaining tour of the entire estate. Although it is elegantly decorated, the building is also comfortable and relaxing and the atmosphere is very inviting. The staff are friendly and social, which sets the tone for your entire visit. The breakfast is delicious and gourmet. There are also evening refreshments which are available to guests after a long day of exploring the city of Asheville.